ALAN Jackson calls himself a ‘small town southern man’ but he made a big entrance at the Hunter Valley. Jackson was the international headliner at the fifth annual CMC Rocks festival, and many fans had been waiting for hours to make sure they had a good spot for the singer’s performance on Sunday night. And Jackson did not disappoint, working through all of his No 1 hits including Summertime Blues, Don’t Rock the Jukebox, Chattahoochee, Where I Come From and It’s Five O’Clock Somewhere. The 52-year-old Georgia native, who has sold more than 50 million albums, threw dozens of guitar picks into the cheering crowd. Local legend John Williamson warmed up the main stage for Jackson, getting the second biggest reception of the festival. Other highlights from Sunday included Nashville-based husband and wife duo O’Shea’s hour-long set, featuring covers of Tom Petty’s Free Falling and AC/DC’s You Shook Me All Night Long, and Jasmine Rae’s duet with Joe Nichols, from her new album Listen Here. The performance was being filmed for a video clip for the song, and when Nichols had sound issues with his microphone the crowd was treated to a repeat of the ballad. Rae said it was a dream come true to sing with her favourite singer in her first-ever duet. The 2008 Telstra to Tamworth winner was also given the career-changing opportunity of supporting Alan Jackson on his current Australian tour after Miranda Lambert pulled out because of sickness. Nichols closed out Saturday night’s festivities with his hits Brokenheartsville and Tequila Makes Her Clothes Fall Off. “I had a fun time last night,” said Nichols backstage on Sunday. The bass singer will be back in Australia in April for a national tour in support of his greatest hits album. “It’s a milestone, but it feels like the closing of a gigantic chapter of my life,” he said. Aussie favourite Kasey Chambers was another highlight of Saturday night. The petite singer songwriter performed a bluegrass medley of her song Not Pretty Enough, Michael Jackson’s Beat It and Stayin Alive by the Bee Gees. Chambers also sang two duets, one with her son Talon and one with Katherine Brit She hits the road with her husband and fellow musician Shane Nicholson, who is about to release his new album Bad Machines, later this month. 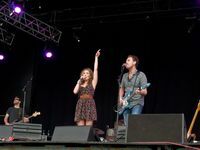 Hot on the heels of their Golden Guitar win at Tamworth in January, sister trio The McClymonts played an energetic set. Their current tour is the last chance for fans to see the Grafton girls before they travel to Nashville to work on their next album. 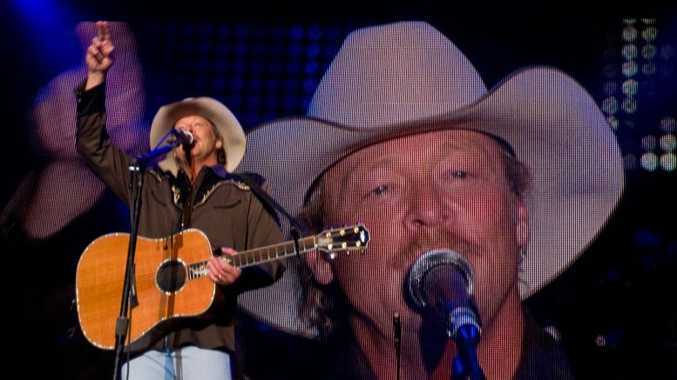 Alan Jackson finishes his tour in Brisbane with three sold out shows at the Brisbane Entertainment Centre - a feat only accomplished by one other band, AC/DC - on Thursday through Saturday (March 10-12). Eight hours of highlights from CMC Rocks the Hunter will air on the Country Music Channel on April 2.